Located about 90km off the north coast of Central Java, the Karimunjawa Islands is one of those places that is amazing to visit, yet has few visitors. During non-peak times it is possible to go a full day without seeing another foreigner and this is probably due to the fact that it require visitors to Java to deviate from the normal route through the island which generally goes Jakarta, Bandung,Yogyakarta, Bromo, Bali. But changing up that standard itinerary really allows you to access some amazing places such as these islands. Getting to Karimunjawa requires a ferry ride from the port town of Jepara, 2 hours by bus from Semarang. All but the cheapest of cheap will elect to take the fast ferry which only takes 1 hour 45 minutes and costs 69,000 rupiah. It departs Jepara on Monday, Tuesday, Friday and Saturday. If you really must take the slow ferry, it takes six hours and departs Jepara on Saturday, Wednesay and Monday. Neither of these ferries depart if the weather is bad, so it is possible to get stuck on the island or in Jepara should you be unlucky. Until recently another ferry, the Kartini, travelled from Semarang to Karimunjawa then back to Jepara and generally had a mixed schedule that is hard to decipher. Needless to say, it had stopped running when we conducted our research due to mechanical issues and no one could say whether it would be up and running again. Still, even if it is running, the journey from Semarang on this vessel is not easy to arrange and requires you to head down to the port to buy a ticket. 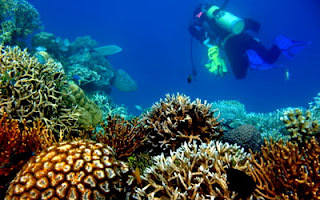 So is it worth the journey to get to the Karimunjawa Islands? It all depends on what your definition of paradise is. Does this look like the sort of place you’d want to visit?